Immune System is body's natural defensive mechanism against infections and diseases. People with weak immune system are more prone to be attacked by various kinds of infections and diseases. A body with weak immune system opens the door for several diseases and prone to fall sick frequently. Such bodies are more susceptible to fatal diseases while a body with strong immunity fights off disease-causing microorganisms and boosts the healing process more quickly. To boost your Immune system try to increase the daily intake of Vitamin C. Strong anti-oxidant properties of vitamin C not only increase the productions of lymphocytes but also boost the activity of immune system. Antioxidants neutralize free radicals and help your immune system function properly. Important sources of Vitamin C are lemon, lime, guava, papayas, kiwi fruit, strawberries, black currants, oranges, tangerines, grapefruit, pomegranate and mangoes. Many vegetables contain Vitamin C including collard greens, green and red peppers, broccoli, tomatoes, brussel sprouts, cabbage, kale, spinach(palak), and watercress. Try to eat foods rich in protein. Protein is a building block for a healthy body including organs, tissues, cells, hormones, enzymes and immune system. Diets low in protein usually tend to be high in carbs which convert readily to glucose, boosting blood sugar and stressing the pancreas and the immune system. Eggs, white meat (chicken), fish, lean beef, mutton, milk, cottage cheese, greek yogurt (low in fat), broccoli, asparagus, spinach, edamame, peas, beans, lentils, almonds, peanuts, and pumpkin seeds are good sources of protein rich foods. Vitamin D specially vitamin D3 is highly helpful to boost your immune response. A deficiency of vitamin D is associated with increased vulnerability to infection. According to recent scientific research, vitamin D works to maintain tolerance against infections and promotes protective immunity. Hence, to boost your immunity, try to maintain the essential amount of vitamin D in your body by eating foods rich in vitamin D.
Fatty fish like salmon, tuna and mackerel, cod liver oil, cheese, egg yolks, are good natural sources of vitamin D. Fortified milk is also a good source of vitamin D.
In addition, exposure to sunlight is a great natural way to trigger the production of vitamin D in the body, so try to expose your body to early morning sunlight for 10 to 15 minutes daily. However, If you are not getting sufficient Vitamin D by food sources or sun light, you can also take vitamin D supplements after consulting a doctor. Antibacterial and antiviral properties of garlic make it a powerful immune booster. It also contains properties of good antioxidants and fight against free radicals which may damage body cells. Garlic not only boosts the production of disease fighting whiting blood cells but also promotes the ability of white blood cells to fight against disease causing microorganisms. Anti-viral, anti-bacterial and anti-fungal properties of cinnamon are very helpful in boosting your immune system. Cinnamon(dar chini) is rich in antioxidants (polyphenols and proanthocyanidins) and helps a lot to improve immune system. Cinnamon not only slows down the growth of bacteria but also helps in stabilizing blood sugar level. Anti-oxidant, anti-inflammatory and anti-carcinogenic properties of green tea are highly beneficial in boosting your immune system. Green tea contains EGCG (epigallocatechin gallate) antioxidant, a type of flavonoid that fights bacteria and viruses, and stimulates the production of immune cells. EGCG can also lower the risk of getting many type of cancers. Green tea EGCG can improve lymphocyte responses and seem to have anti-inflammatory effects. Green tea also contains a good amount of of polyphenols which help in clearing the free radical. So try to use it as a replacement for other drinks like soda or coffee. 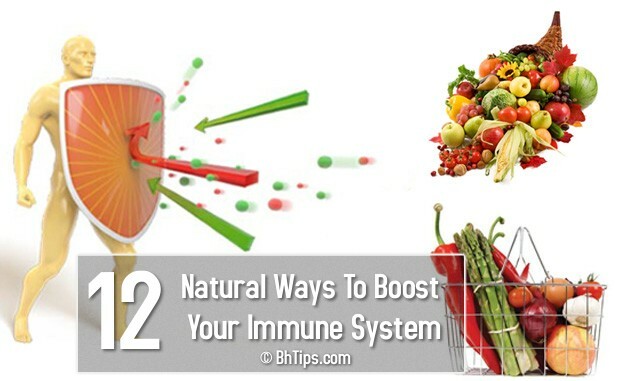 Even a daily consumption of only 2-3 cups can help a lot in boosting your Immune activity. Anti-inflammatory properties of Omega-3 fatty acids are very helpful in improving the response of Immune system. In addition to improving immune system, omega-3 fatty acids are also very helpful in reduction of excess body fat. Good sources of omega-3 fatty acids are fatty fish (salmon, halibut, and sardines), walnut, canola, soybean, pumpkin seeds, flax seed and olive oils. Carotene, like the beta-carotene found in carrots are the natural protectors of the immune system. Carotene improves the production of infection killer white blood cells. Eating foods rich in beta-carotene helps the body fight off infection more quickly and efficiently. Beta-carotene also enhances the ability of the natural killer cells to attack cancer cells. Natural antioxidant, antibacterial and antimicrobial properties of honey helps a lot to protect the body against bacteria, viruses and fungi. It helps to soothe a sore throat, and treat coughs and colds. One tablespoon of honey a day is highly beneficial for the immune system. You can also drink a glass of lukewarm water by adding a tablespoon of honey and 1 teaspoon of lemon juice. Mix them well and drink this glass of lukewarm water on an empty stomach just half an hour before your breakfast. This is an other great way to boost your immune system with added benefits of lemon juice which is an other excellent Immunity booster. Turmeric(haldi) is highly beneficial to boost your immune system. It contains curcumin, whose antioxidant action improves the functioning of the immune system. Curcumin in turmeric, also helps improve the cell membranes, which makes the cells more resistant to infection. Try to add more turmeric in cooking recipes. In addition, take a glass of warm milk and add 1 teaspoon of turmeric and 1 teaspoon of honey. Stir well and drink it lukewarm. Increase intake of zinc because it boosts the production of white blood cells and improve immune system. Zinc acts as a catalyst in the immune system's killer response to foreign toxic and infectious agents, and it protects the body from damage from invading cells. In addition, Zinc also helps to build, and repair cells. Lean beef and poultry are good sources of Zinc. Small quantities of fresh almonds, walnuts, and pumpkin seeds are also good sources of zinc. Try to add at least one cup (250g) yogurt in your daily diet plan because it also plays an important role to improve your immunity. It strengthens white blood cells and helps the immune system produce antibodies to fight against infectious agents. Probiotics in yogurt, stimulate immune system cells in the gastrointestinal tract. Probiotics (good bacteria) colonize the GI ( gastrointestinal) tract help you resist bad bacteria and detoxify harmful infectious substances. Avoid intake of saturated Fat. Stop smoking and also avoid secondhand smoke. Avoid refined white sugar. It lowers the ability of the white blood cells to fight and destroy bacteria. Avoid too much of antibiotics. Avoid harmful toxins and pollutants as they can damage immune function and initiate the formation of cell-damaging free radicals. Avoid being Over weight and Exercise on a regular basis. Exercise is also important to boost your immunity. If you can't go and join gym, you can walk, run or jog for 20 to 30 minutes daily. For better immunity, try to include more servings of colorful fruits and vegetables (rich in beta-carotene) in your daily diet plan. Follow proper hygiene routine. Always wash your hands after using the toilet to stop the spread of infection. To avoid germs, don't forget to wash your hands before eating anything. Avoid Stress because it slows down the immune function. Better and un-interrupted sleep of at least 7-8 hours is essential to boost the production of immune cells. Drink at least 10-12 glasses of water on a daily basis as it is a great supporter to increase the immunity level.